A simple Do/Don’t do spread for today. This is a beautiful card – the aces in this deck are among my favourites. This angel is kneeling with a white flower in their hand, focused on something ahead of them. With the wand in the hand, the book on the floor and the candle to one side, it feels like they are undertaking some sort of ritual. It reminds me of my desire to find some meaningful ritual to keep connected to the sacred on a daily basis. I’ve been experimenting with a few different ideas to see what works best for me. This card gives me the impetus to keep it up. More fiery wands energy! This time there is a cautionary note not to try and proceed too quickly. 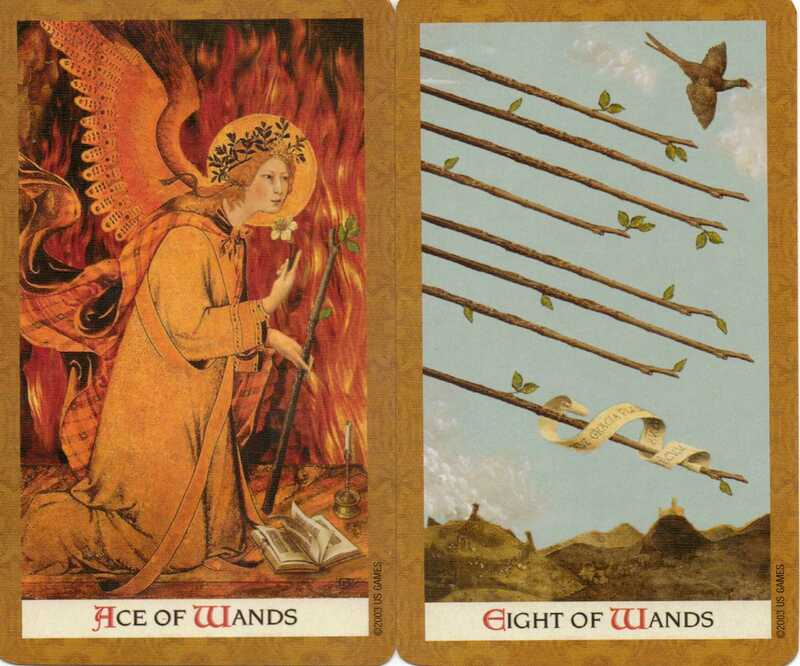 The way that the angel is glancing at those flying wands make me think of those times when I want to see quick results. It is a gentle reminder that sometimes things need to proceed at a slower pace. These cards point to the importance of taking time to ourselves, to slow down and connect. Life does not always have to be lived at break-neck speed. Sometimes we need to be the tortoise rather than the hare. Image Copyright U.S. Games Systems Inc. All rights reserved. The Golden is such a lovely deck! Aww, such a lovely deck and reading your posts makes me wanna take it out for a spin next week. You are right, the Aces are amazing! It would be good to see someone else reading with it, Jema. I really like it.